This interesting recipe is hearty enough to be a satisfying meal. The lean pork mince combined with crabmeat complement the intense taste of soy sauce, oyster sauce, and dry sherry, while large Iceberg lettuce leaves add a nice touch of tenderness that simply melts in your mouth. Enjoy! Cover mushrooms with boiling water, stand 30 minutes. Drain, remove stems and chop. Chop water chestnuts, bamboo shoots and shallots finely. Heat wok. Add pork and crab. Stir well and cook until browned. Add vegetables and cook for one minute. Combine sesame oil, soy sauce, oyster sauce and sherry. Add to pan, toss until well combined. Remove from heat. 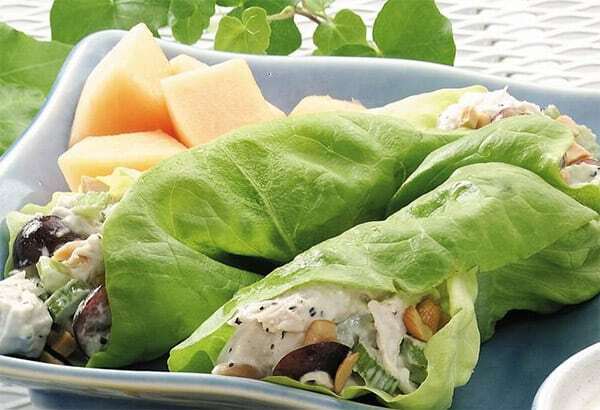 Put heaped tablespoons or pork mixture into lettuce leaf. Fold and roll up and serve immediately. Makes approximately eight rolls. Serves 4.